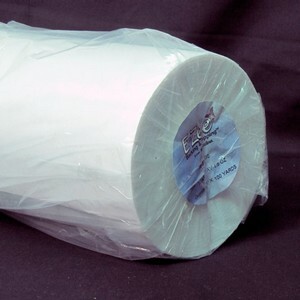 E-Zee Tear 1.5 ounce is a medium weight, high quality Tear Away stabilizer. The crispness of this backing provides a clean tear when torn away from the back side of a design. It is ideal for use with designs where the backing will be torn away completely to avoid irritation with the skin. Use on woven fabrics with medium sized designs. Tear Away backings should be used for stable, woven fabrics, like twill, denim and canvas. Cut a piece from a roll or select a piece of pre-cut to fit your hoop size. Hoop by placing the backing underneath the garment. Embroider the design and remove the embroidered item from the hoop. Carefully tear the excess backing away, to avoid excess pressure on the design. When removing E-Zee Tear®, begin by pulling the excess from where there are points, such as corners or thin columns. Tear from the outer edge in towards the design, which will produce a minimum amount Of pressure and the least amount of distortion to the design.